It was a beautiful day for a canoe journey. Standing on the long pier at Suquamish, you could see them as they rounded the point at Jefferson Beach, paddles glistening, pulling in a rhythmic motion. 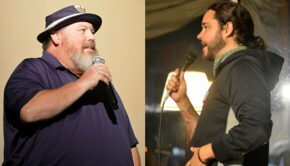 They began as tiny canoes against the skyline of Seattle and Mount Rainier and grew larger and louder as they approached, the captain of each canoe calling out directions. Throughout the day on Monday, July 25, 70 tribal canoes landed on the shores of Suquamish for a two day layover as they made their way to Olympia, the final stop of this year’s annual Tribal Canoe Journey called the Paddle To Nisqually. For six days while there, the convened tribes and visiting nations celebrated the cultural and maritime history of the Northwest’s first people. 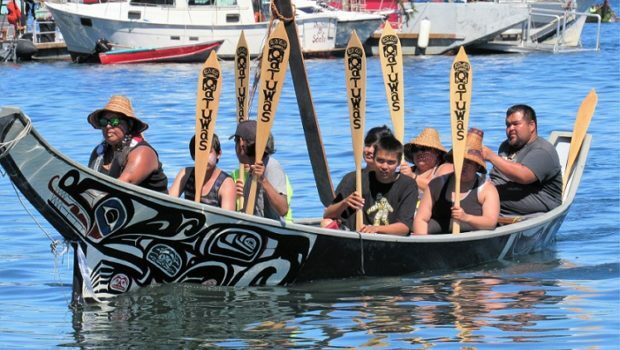 In Kitsap County, we have two tribal nations who both annually host the Canoe Journey and, depending on the final destination, serve as back-to-back hosting tribes. It’s about 26 nautical miles between this year’s landing at Suquamish and the previous day’s resting stop hosted by the Port Gamble S’Klallam Tribe. In prior years the tired pullers would land on the Suquamish shore and, with a handful of volunteers, hoist their heavy, wooden dugout canoes on their shoulders to walk up the ramp to the lawn in front of the House of Awakened Culture. 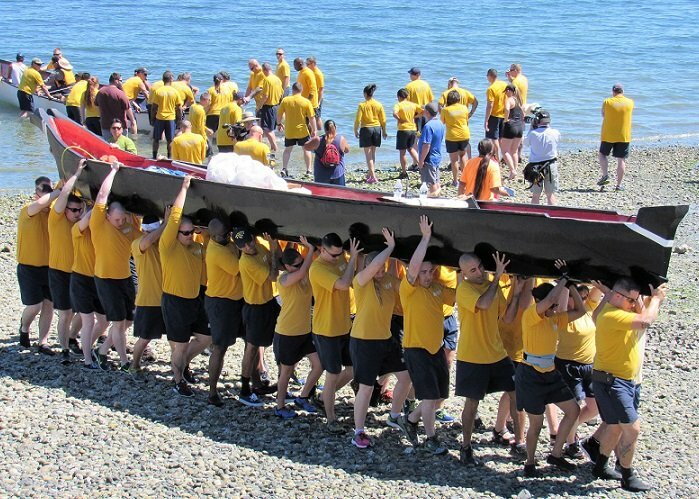 This year, a group of Navy men and women stationed in Kitsap County volunteered to carry the canoes. It was an inspiring sight to watch each canoe stop before landing and ask permission to come ashore (often in their tribal language) from Suquamish Tribal Chairman Leonard Forsman. 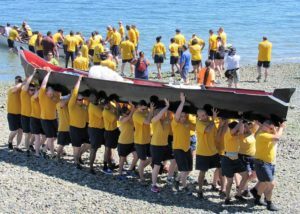 Yellow-shirted Navy volunteers then waded into the water, lifted each canoe and carried it uphill passing by the flagpole with the waving flags of the United States and the Suquamish Tribe to the applause of watching spectators. The symbolism of that cooperative effort was heartwarming — the original first peoples of Kitsap County sharing their culture and tradition, getting assistance from young Navy men and women, most just passing through on a tour of duty, to the applause of a crowd of Native and non-Native spectators, all under the flags of two sovereign nations. Over the next two days there were evening salmon and clambake meals served by Suquamish tribal members and community volunteers followed by tribal singing, drumming and dancing by the visiting tribes in the Suquamish House of Awakened Culture — a tradition that allows the visiting tribes to thank the host tribe for its hospitality. Viewing the canoes all grouped on the grounds above the shore was akin to visiting a tribal maritime museum. Each one is a work of art and symbolism; a dug-out canoe made of trees that are found on each tribe’s land. The style varies by tribe, though all have to be seaworthy enough to withstand the open water canoeing of the Salish Sea, also known as Puget Sound. Some are painted, some bear tribal flags and wreathes of cedar branches. Some canoes have made the journey more than once and others are first-timers. 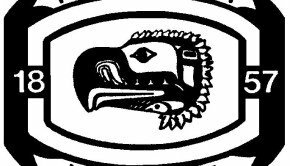 The new Makah canoe was carved by students at Neah Bay High School. Two common local misperceptions: the Canoe Journey ceremonies aren’t the same as Suquamish Days, which occurs a month later and is open to the public. You can watch and photograph the canoe arrival and departures, attend the evening dancing and drumming ceremonies and even volunteer to serve food and clean up. The tribes ask that you’re respectful and that you don’t bring or consume alcohol or drugs as the Canoe Journey is a tradition that promotes health and healing for the pullers and the tribes.